Earlier Parker had acquired other important key paintings from Sebastian such as "Mick Jagger with Microphone and Saliva String", "Stones 40/40", "Keith - London Calling", Jimi Hendrix and others. 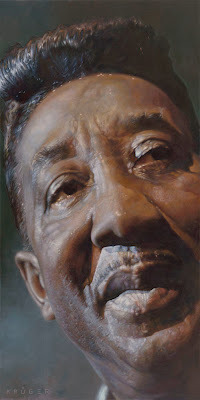 The original order of 6 'Blues Legends' commissions have recently been extended to eight, so there are more to follow. "I love Blues music; it's origins and it's influence on music in general." says Parker. Presented here is the first Blues Legend painting 'Muddy Waters'. It's acrylic on canvas, 80 x 160 cm (31 x 63 inches). Every week we will present two additional Blues paintings by Krüger so stay tuned.